An FBI agent was shot in the shoulder while he was working in Brooklyn, the NYPD said. Wale Aliyu reports. An FBI agent was shot in by someone driving in a BMW in Brooklyn on Saturday afternoon, law enforcement officials said. The agent was shot in the shoulder, but was conscious and alert when he went into surgery at Kings County Hospital, the sources told NBC 4 New York. 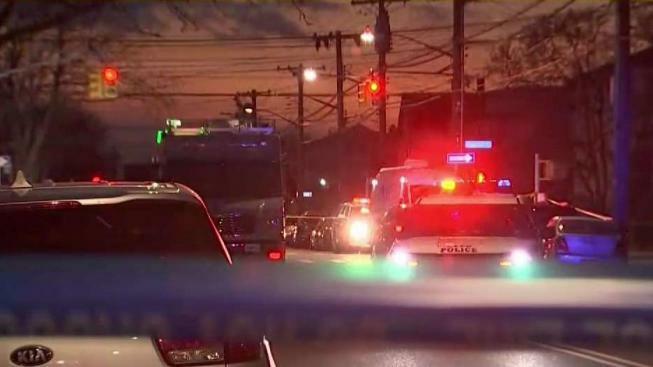 The agent was on duty performing surveillance for a drug investigation in Canarsie when the suspect, in a BMW, drove the wrong way down a one-way street and opened fire into the agent's vehicle, the sources said. The agent may have tried to intervene with the driver before the gunshots began, the sources said. The agent pulled his car around to pursue the BMW, the sources said. Then the agent got out when he stopped at a corner and fired more than 10 times at the BMW. The suspect ditched the BMW at an auto body shop and got a friend to drive him to the hospital, the sources said. The suspect was in custody and in surgery for a gunshot wound to the hand, the sources said, while the acquaintance was being held on a charge of driving with a suspended license while the investigation continues. Police Chief Terence Monohan tweeted that no suspects were at large. There are no outstanding suspects at this time. Expect a large police presence in the area of 92nd Street & Avenue N in #Brooklyn as the investigation continues.